This project involved the Archaeological Historical Landscape Research Group, the community of Easton Royal, the School and the Heritage Group in a quest to research and map the location of the lost Trinitarian Priory. The fact that there were only a few priories of this order makes it a project of international importance. The Trinitarians were involved in the repatriation of Christian prisoners held in Muslim lands. The aim was to identify the Priory location by using archives in the British Museum, the Wiltshire and Swindon History Centre and Longleat Estate Archives and to carry out full topographical and geophysical surveys to locate any surviving features associated with the Priory and its buildings. 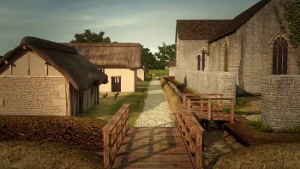 The results were used to create a 3D animation of how the Priory could have looked. Test pits were excavated in many gardens of the village to try and locate features or finds possibly associated with the Priory and to map and understand the development of the village from the prehistoric period. may have looked - from the DVD. Reports of the investigation and expert analysis with interpretation of the findings were collated for publication and a free DVD was available to every household in the village. Through preliminary discussions with members of the community, observations on the ground and the study of maps and aerial LIDAR images it has become apparent the Roman road running south from Cunetio (modern Mildenhall) may have passed through Easton Royal on its route to Sorviodunum (Roman Salisbury). More excavations will be taking place to investigate this possibility.